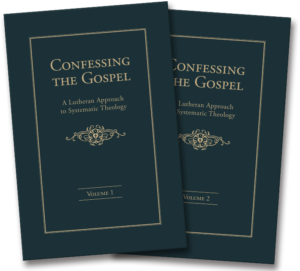 Confessing the Gospel: A Lutheran Approach to Systematic Theology is a new, two-volume dogmatics that is the culmination of a decades-long project that began in the 1980s. It has been almost a century since the Missouri Synod last published a new dogmatics, the most recent being Francis Pieper’s three-volume Christliche Dogmatik, which was published between 1917 and 1924. To bring about this latest work, nearly seventy theologians from the LCMS and its partner churches from around the world have participated as contributors. General editor Samuel H. Nafzger—together with John F. Johnson, David A. Lumpp, and Howard W. Tepker—has taken great care to present a dogmatics that presents the Gospel taught in Scripture and expounded on in the Lutheran Confessions in light of ecclesiastical developments of both the past and the present. This project has as its fundamental presupposition the conviction that a systematic treatment of Christian doctrine is nothing more or less than an explication of the Gospel as summarized by Jesus in John 3:16. A Lutheran approach to this task recognizes that this explication must be normed by “the Scriptures of the Old and the New Testament as the written Word of God and the only rule and norm of faith and of practice,” and as confessed in “the Symbolical Books of the Evangelical Lutheran Church as a true and unadulterated statement and exposition of the Word of God” (LCMS Constitution, Article II). A brief application of each topic to the exercise of Gospel ministry, showing how this topic belongs to the proclamation of the Gospel today. Confessing the Gospel: A Lutheran Approach to Systematic Theology will be available August 8, 2017. Barbara Shippy was an associate editor at Concordia Publishing House. She attended the University of Missouri—Columbia, where she studied journalism and French. Barbara and her husband enjoy going to baseball games, traveling, and playing on the worship team at church.